Building materials are stacked as construction continues on the inaugural platform in preparation for the swearing-in ceremonies for President-elect Donald Trump on the Capitol steps in Washington, Dec. 8, 2016. Trump will be sworn in as president on Jan. 20, 2017. Preparations and security operations are well underway a month before Donald Trump's inauguration as president of the United States, which is expected to draw an unprecedented number of protesters. Though many members of the military and the National Guard have been planning this inauguration since 2012, the local armory building in Washington, D.C., opened its doors to display a large map of the city and explain the plan and movements of the president on Inauguration Day. Trump and Vice President-elect Mike Pence will start at St. John's Episcopal Church, after which they will head to the White House to meet with outgoing President Barack Obama, who will hand Trump a physical, albeit symbolic, key to the White House. After administrative documents are signed, a motorcade will begin from the White House to the Capitol for the swearing-in ceremony. "Generally speaking, the inauguration is taking shape as it has in the past, though things are subject to change," Brigadier General George Degnon, deputy commanding general for the presidential inauguration, said at a news conference Wednesday at which he addressed questions about how this inauguration would be different than those before it. 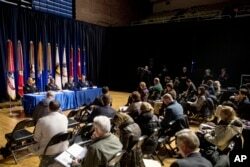 Reporters interview officials on the inaugural preparations being made by the Joint Task Force-National Capital Region for military and civilian planners at the D.C. Armory in Washington, Dec. 14, 2016. The Joint Force Committee, which includes members of the military and some District of Columbia National Guard members, cited the most basic, but also the most real, threats to the inauguration parade: getting all their members properly credentialed, and having a contingency plan for hundreds of thousands of people in case of inclement weather. Thousands of National Guard members will be deputized by the D.C. Police Department, giving them the power to make arrests. Though the deputization has been common practice, arrests are rarely made. At Obama's first inauguration in 2009, which saw one of the largest crowds in history, troops made no arrests, said Major General Errol Schwartz, commanding general of the D.C. National Guard. Because the events of Inauguration Day largely take place outdoors and in January, weather also is a pressing concern. Military personnel have three uniforms for inclement weather. Their commander will decide at 4:30 a.m. January 20 which one they will wear. In 1985 at Ronald Reagan's second inauguration, the ceremony outside the Capitol was canceled because of snow, wind, and record low temperatures; it took place inside the building instead. As Trump prepares to take office, though, police, military and security personnel are facing an added challenge. "Clearly, the biggest concern at this point is the number of potential protesters," said Major General Bradley Becker, commanding general of the Joint Force Headquarters-National Capital Region. Women march against U.S. President-elect Donald Trump in Manhattan, New York, Nov. 13, 2016. According to a Facebook event page, hundreds of thousands of people plan to participate in the Women's March on Washington the day after the inauguration. The march, the largest of more than a dozen planned in Washington over inauguration weekend, was the first to receive its permit Friday. "The Women's March on Washington will send a bold message to our new administration on their first day in office and to the world that women's rights are human rights. We stand together, recognizing that defending the most marginalized among us is defending all of us," the organization's mission statement reads on its website. The Facebook event page has about 150,000 people marked as "attending" and another 240,000 people marked as "interested" in marching on January 21. The ANSWER (Act Now to Stop War and End Racism) coalition is one of many groups seeking permits to protest on Inauguration Day. Nearly 20,000 people have RSVP'd on the group's website. 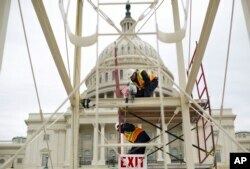 Construction continues on the inaugural platform in preparation for the swearing-in ceremonies for President-elect Donald Trump on the Capitol steps in Washington, Dec. 8, 2016. Both organizations cite hateful rhetoric against marginalized groups during Trump's political campaign, saying their mission involves countering this hate and making sure the new government knows that minorities and women are united in "numbers too great to ignore." Many pro-Trump groups also are expected to convene to watch the inauguration in Washington. One of those is Bikers for Trump, made up of motorcyclists who staged rallies throughout the country leading up to the election, and who plan to ride through the city on Inauguration Day. A GoFundMe campaign for Bikers for Trump has raised over $18,000 to pay for lodging and fuel for those riding to and through Washington. As many as 1 million protesters, on various sides and from various groups, could make it to the inauguration or gather the day after, according to calculations by Stephen Fuller, professor and faculty chair at the Center for Regional Analysis at George Mason University. Fuller's "low estimate" is that 200,000 people will attend inaugural events. Hotels throughout the capital are almost fully booked just with just those expected attendees, but Fuller said many protesters would either be making day trips or finding alternate lodging. "These are people who are staying with friends. I have some friends who have a bunch of people coming from California to stay at their house and sleep on the floor," Fuller told VOA. "People even called us up and said, 'Are you going to be home? Can we stay with you?' 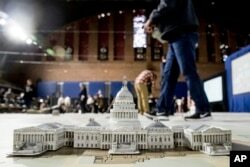 "
A model of the Capitol is displayed on a giant planning map during a media tour highlighting inaugural preparations being made by the Joint Task Force-National Capital Region for military and civilian planners at the D.C. Armory in Washington, Dec. 14, 2016. Though the number of protesters expected in Washington is unprecedented, Fuller said, the general number of attendees, in whatever capacity, is similar to the number for Obama's inauguration in 2009. 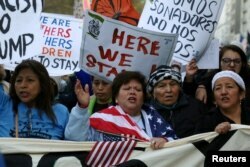 It's therefore a crowd size that local and federal authorities are equipped to deal with. "I think the Obama inauguration in 2009 is a good model, because security is basically crowd management," Fuller said. One of the biggest security concerns for Inauguration Day is securing the president-elect himself and preparing for "the one oddball with a gun," according to Fuller. "But the next day is simple," he said, referring to the women's march, which will occur long after the parade and ceremony, when Trump presumably will be secure inside the White House. "They don't have to guard him against this; they have to guard protesters from each other," Fuller said. 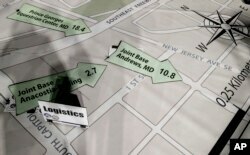 Directional signs are displayed on a giant planning map during a media tour highlighting inaugural preparations being made by the Joint Task Force-National Capital Region for military and civilian planners at the D.C. Armory in Washington, Dec. 14, 2016. The National Park Service is in charge of clearing permits for protests, because most of them occur on the National Mall and around monuments. The reason many demonstrations still lack permits is that the sheer number of groups protesting presents new challenges to the park service, not to mention security forces that will have a harder time keeping the large influx of people within designated areas, as well as quelling any potential tension between them and supporters of the new administration.